Markets across the region also finished firmly in the green. Japan's Nikkei closed up 1.1% at 18,574.55. Hong Kong's Hang Seng ended higher by 3.6% at 21,838.54. Key European markets were all higher by more than 2% in early afternoon trading Thursday. U.S. stocks jumped higher after the opening bell too. The Dow, S&P 500, and Nasdaq were all up more than 1% just minutes after the open. The Dow, which had been in correction territory, trimmed its year-to-date loss to 7.5% Thursday morning. Today's rebound followed a terrible week for China's stock market. Wednesday marked the fifth straight day of declines for the Shanghai Composite. The benchmark fell below 3,000 for the first time in eight months on Tuesday to close at 2,964.97. In the five days from Aug. 19 through Aug. 26, the index shed 23.3%. In an attempt to calm markets, China's central bank cut its key lending rate by 0.25% to 4.6% Tuesday. The People's Bank of China (PBOC) also reduced banks' minimum reserve requirement by 0.5%, effective Sept. 6. 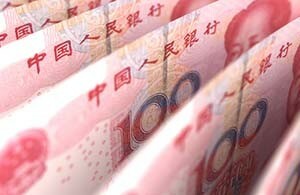 The move will add roughly 678 billion yuan (about $105.7 billion) into the Chinese economy. Today is Fibonacci day on the Spiders, retracing almost to the .618 point of the loss ( to 201) before resuming the downtrend next week. Enjoy the ride!